Running Start (RS) program provides academically motivated students in Washington high schools an opportunity to take college courses as part of their high school education. Both high school and college credits can be earned for the completed courses. Enrolled in a Washington public high school, be a junior or senior at time of taking RS courses. Home-schooled students, see eligibility guidelines. To maintain eligibility, see Frequently Asked Questions. Washington State’s law governing the program. 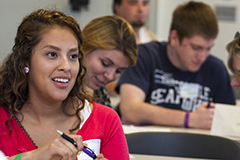 Apply to Columbia Gorge Community College (CGCC), take the Placement Assessment (study guides). Complete an Enrollment Verification Form with high school counselor to confirm the number of credits eligible through the RS program. Return the form to RS college advisor at the start of each term for verification and billing purposes. Complete a Release of Information form listing parent(s) under “Release Information to”. This allows college advisors to disclose the selected information to their parents (optional). Register for classes. Under payment options, select “Bill Later”. A tuition bill for eligible credits will be sent to your high school. A separate bill for ineligible credits, fees, and books will be sent to you. Attend New Student Orientation (optional). Meet with a CGCC Academic Advisor prior to registration each term to get the “OK” to register and verify college courses. Students are responsible for registering for their college courses. Meet with high school counselor to complete an Enrollment Verification Form prior to beginning each term. Students who do not return the Enrollment Verification Form to the CGCC Running Start advisor may risk being billed for the term's tuition.